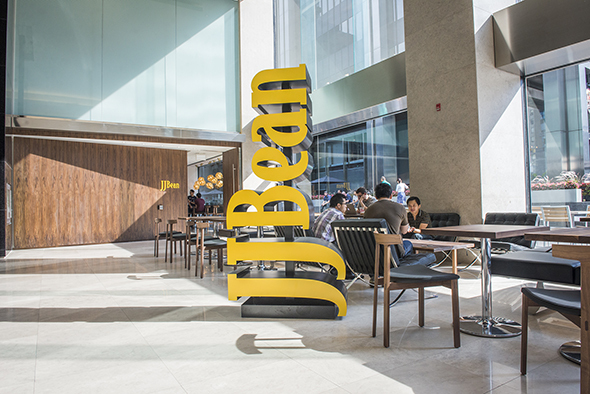 JJ Bean's second Toronto location is its first located downtown in the Financial District . It can be found in a corner of the lobby at the Richmond-Adelaide Centre, where a large yellow vertical sign of the brand's logo indicates its presence. 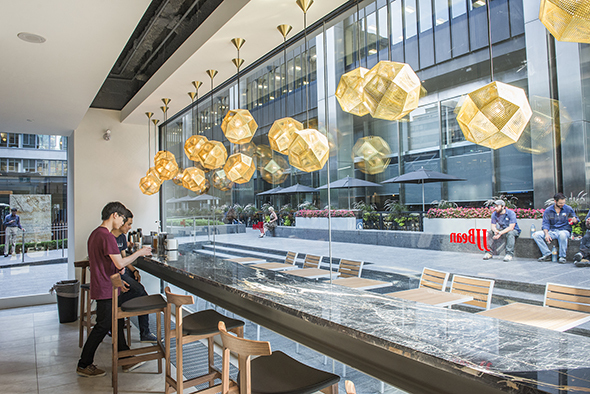 This Vancouver coffee chain adapts the look of its cafes to its surrounds, and here the compact interior space is sophisticated and professional, outfitted in dark wood, black marble counters and eye-catching golden light fixtures shaped like spherical polyhedra. Seating sprawls out from the shop into the main lobby space, and there's even an outdoor patio. 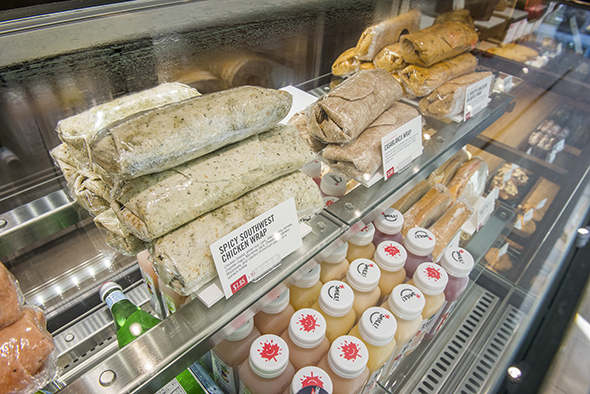 They're all about consistency at JJ Bean, so the offerings at this spot are the same as those in Vancouver; in fact, experienced hands who've worked at the Vancouver locations are here to ensure the coffee is up to par. 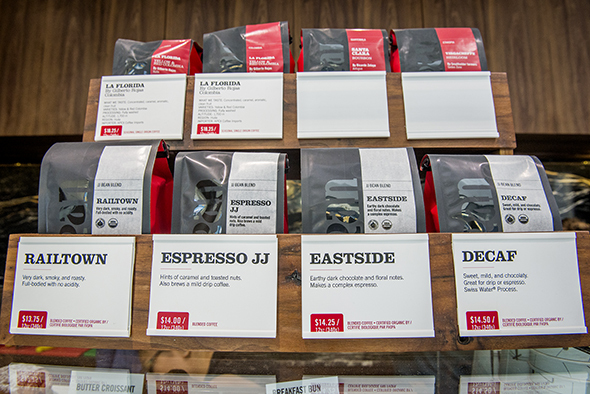 While the beans are the same as those used on the west coast, they're roasted locally at JJ's roastery, commissary and cafe in East York . 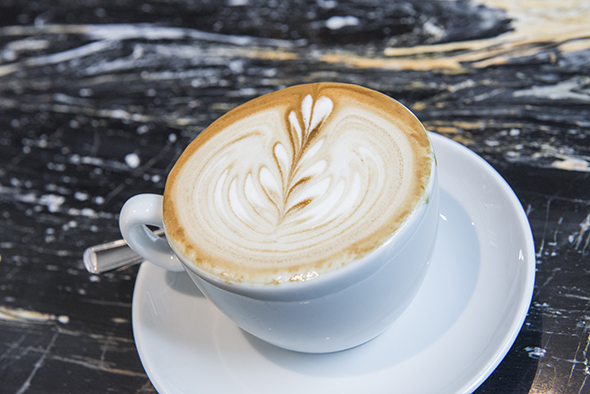 Coffee-lovers can choose from drip, French press and espresso, and the types of beans and blends used that day are always listed. 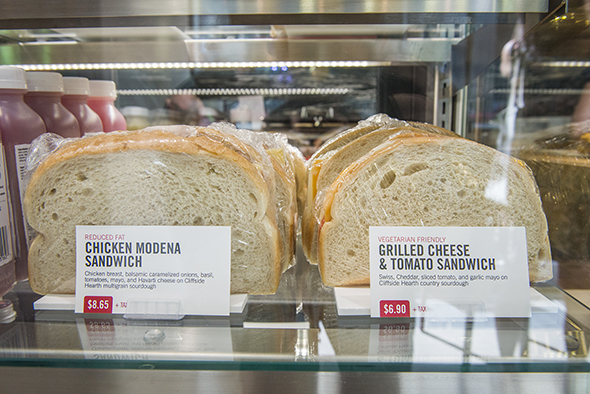 Brewed coffee ($2-$2.60) and "new school" espresso-based beverages (Americano, $2.85-$3.45; latte, $3.65-$4.45; mocha, $4.20-$5) come in three sizes while classics like an espresso shot ($2.85), macchiato ($3.20) or cappuccino ($3.65) are sized traditionally. Food is delivered daily from JJ's commissary, and everything from the croissants ($2.95-$3.15 each) to the cinnamon buns ($3.25 each) are baked fresh on site. I arrive right after the morning rush (this outpost is open from 6am to 6:30pm on weekdays and from 9 to 5 on weekends), but a steady stream of caffeine fiends continues to trickle through during our visit. 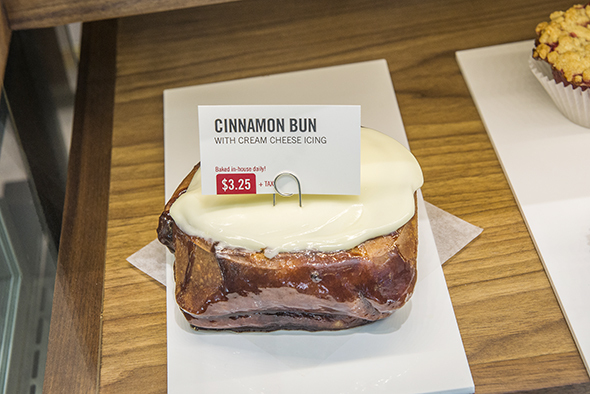 I overhear one customer proclaim his cinnamon bun to be "outstanding" - he claims he's tried them across the city, and this is the best he's had. 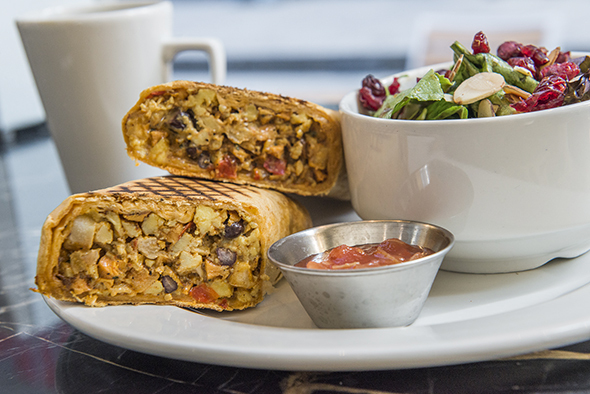 Since I feel like having something savoury, I try a veggie-friendly El Wrappo Ranchero breakfast wrap ($6.90), which contains a spicy veggie hash, cage-free scrambled eggs, black beans, chipotle mayo, Monterey Jack, cheddar, habanero mozzarella and cilantro-lime sauce on a salsa tortilla that has perfect-looking grill marks on it. It even comes with a side salad of greens topped with cranberries and almond slivers, making it a substantial enough meal to double as a good lunch. A few Vancouver natives who are already fans of the brand stop in, excited that they can now have a taste of home in downtown Toronto. Then there are the new converts who hadn't previously heard of JJ's. "This is what coffee should taste like," says one appreciative man. 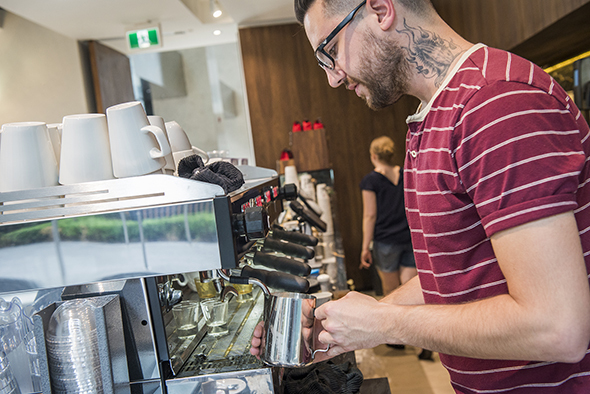 He asks the barista, "Now, did you have to take up training for this?" "Just seven years," is the response.